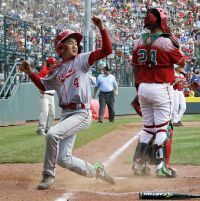 Yugo Aoki singled for Tokyo’s first hit in the seventh inning, and then scored on a fielder’s choice to help Japan beat Mexicali, Baja California, Mexico, 1-0 on Saturday for a spot in the championship game of the Little League World Series. The run came home when Mexico was unable to turn a double play on a bases-loaded ground ball up the middle by Koki Jo. It was the only offense during an impressive pitching performance for Japan’s Kabu Kikuchi and Mexico’s Armando Verdugo. Kikuchi allowed four hits and struck out 10. Verdugo also struck out 10 and gave up just two hits, both in the extra frame. Tokyo, the international champion, will play the winner of the U.S. championship between Pearland, Texas, and Lewisberry, Pennsylvania, on Sunday for the World Series title. Aoki led off the seventh with a grounder to shortstop Jorge Armenta, who made a nice play on a bad hop but was unable to get Aoki at first. Kengo Tomita then doubled over the head of left fielder Ernesto Rios. Kikuchi reached after catcher Raul Leon dropped a third strike and didn’t throw to first. Verdugo then struck out Nobuyuki Kawashima, but Jo hit a ground ball past the pitcher to drive in the winning run. After its first loss to Japan, the Mexican team got into a groove at the plate, winning games against Australia, Taiwan and Venezuela by scores of 14-3, 11-1 and 11-0. But Kikuchi held its big hitters in check, throwing 57 strikes in 77 pitches. Mexico dropped to 0-6 against Japan in its last three Little League World Series. It is 11-0 against everyone else in the same stretch. Manager Jorge Armenta said he doesn’t know why. Mexico’s biggest threat came in the fifth inning. First baseman Daniel Zaragoza hit a leadoff double to left-center and advanced on a sacrifice by Alberto Bustos. But Kikuchi then struck out pinch-hitter Damian Garcia and center fielder Derik Lopez. Japan threatened in the bottom of the sixth, when Shingo Tomita reached on a questionable two-base error with two outs. Tomita’s line drive to left was dropped by Ernesto Rios, who appeared to be transferring the ball to his throwing hand when it fell out. But Yuma Watanabe grounded out to third to end the threat. This Kitasuna Little League won the World Series in 2001 and 2012, and the international championship in 2007. It is seeking Japan’s 10th world title, and the third in four years. Another league from Tokyo won in 2013.